If Amazon’s new Fire TV Cube doesn’t do it for you, maybe you should take advantage of DirecTV NOW’s free Apple TV 4K offer before it disappears. 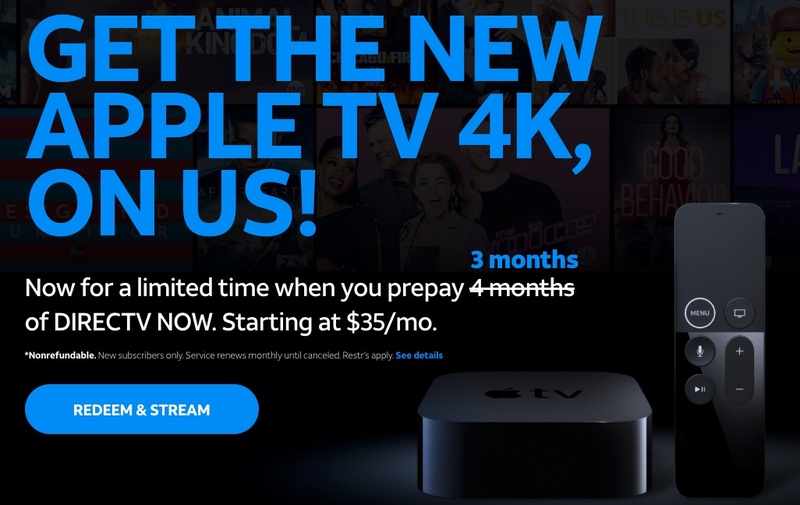 DirecTV NOW has extended the expiration date for the popular Apple 4K offer to run through June 8th. For as little as $105 you get a 32GB Apple TV 4K, (a $179 retail value) and three months of DirecTV NOW streaming television service. The streaming service offers plenty of the popular cable channels, including channels from AMC, Disney, Viacom, and many more. In many areas of the U.S. the streaming service also includes the local network affiliates for the ABC, CBS, NBS, and Fox networks. The offer had been scheduled to end in May, but they’ve given you just a little more time to grab the deal. The deal is available to new subscribers only. AT&T Unlimited Plus wireless subscribers may also score a $20 credit on DirecTV NOW service after the first three months. For more information, visit the DirecTV NOW website.